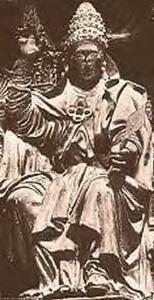 Bust of the pope, r., wearing tiara (triregnum) and cope. 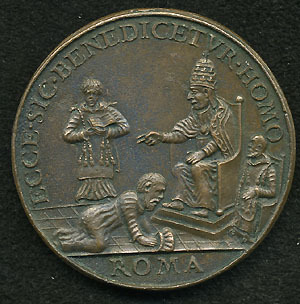 Pope crowned with tiara seated on throne, his right hand in a gesture of blessing; a deacon with book at his right, a seated ecclesiastic at his left; prostrate on the floor, hat in hand, a man (the Duke of Calabria, nephew of King Ferdinand I of Naples)..
On September 11, 1489, Pope Innocent excommunicated a number of Neapolitan nobles for various crimes, especially their refusal to pay feudal dues to the Holy See. On January 28, 1492, an agreement which ended the impasse was concluded. G. Moroni, Dizionario di erudizione storio-ecclesiastica Vol. 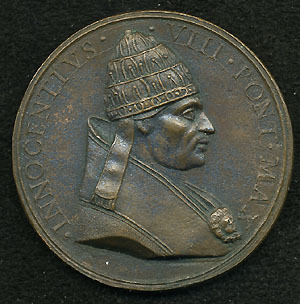 36 (Venezia 1846), 8-9.